The Republican tax overhaul fueled lobbying, particularly during the final three months of 2017. The Business Roundtable, for example, reported shelling out some $17.4 million between Oct. 1 and Dec. 31, during the height of the tax overhaul debate on Capitol Hill. Lobbyists said they felt the increase in business during the first year of the Trump administration and the GOP’s control of the White House and Congress, but some noted that it paled when compared to Obama’s first months in office with Democratic control of the legislative branch. “The first year of an administration is always sort of the big up year,” said Richard Gold, who runs the lobbying practice at Holland & Knight. He said his firm’s revenue was up nearly 9 percent in 2017 when compared to 2016, but its uptick in business in 2009 was about double that, or 18 percent. “So this is big, but not what you would normally expect in the first year of an administration,” Gold said. During Obama’s presidency, lobbying revenue and the number of federally registered lobbyists declined, as Congress in 2011 banned earmarks, a staple of K Street business, and as the economy struggled to recover from the Great Recession. Obama’s restrictions on recently registered federal lobbyists from serving in his administration combined with an overhaul in 2007 of federal lobbying regulations may also have contributed to a decline in those registered to lobby. In both 2009 and 2017, taxation was the No. 1 issue, the lobbying disclosures show. There was a sharp uptick in 2017, however, in the amount spent on tax policy, largely because of the sweeping overhaul legislation passed by both chambers and signed into law in December. Lobbying groups that reported working on that topic spent $2.1 billion last year versus $1.8 billion in 2009, not adjusted for inflation. More than a quarter of all reports last year indicated that the lobbyists who filed them worked on tax issues. 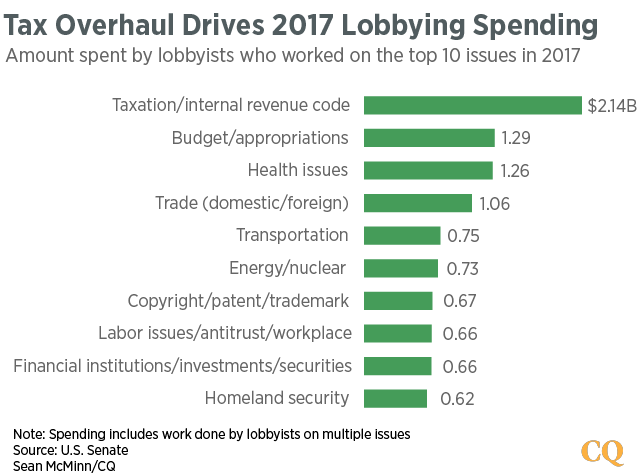 Other topics lobbyists spent large sums on in 2017 were budget and appropriations, health care, trade and transportation, each of which they invested at least $750 million to influence. Immigration, which was a hallmark theme of Trump’s campaign, netted only $507 million in spending — not even cracking the top 10 issues. Far less money was spent on environmental issues this past year than during Obama’s first year: $590 million compared to $935 million in 2009. 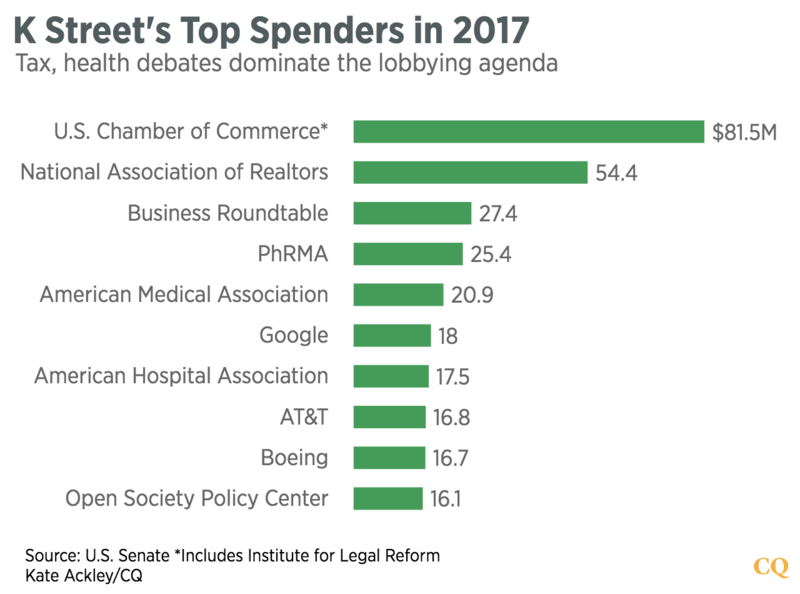 Elizabeth Gore, who leads the lobbying practice at Brownstein Hyatt Farber Schreck, noted a 14 percent increase in federal lobbying fees at her shop in 2017 when compared with 2016. The tax overhaul, an aborted attempt at repealing and replacing Obama’s signature health care law and rollbacks of energy regulations all helped spur the firm’s business, Gore said. “On the energy side, there wasn’t a lot of legislation, but there have been huge shifts on the regulatory side,” she said. Clients were concerned about how Trump, who had never before held elective office, would handle governing and policy specifics.